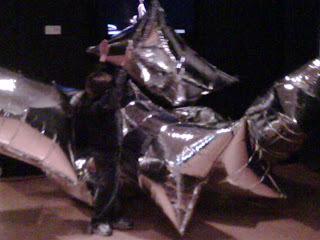 This is Goose at the Warhol Museum dancing in the clouds. We weren’t supposed to take pictures in the museum so we had to sneak a few shots with the Blackberry in this exhibit. I figured that was okay since he was allowed to touch the clouds. Created for a 1966 exhibition at the Leo Castelli Gallery, Warhol created an environment that included one room filled with Silver Clouds, helium-filled balloons which moved with the air currents. In addition to creating an ethereal, joyful atmosphere, they challenged traditional expectations by mingling with and touching the viewer. Made of helium and oxygen-filled metalized plastic film, the Silver Clouds were created with the assistance of Billy Klüver, an engineer and one of a group who sought to bring together artists and new technology.